Here’s the video. A little fuzzy, but gets the point across. I will be sending it out for publication. After it finds a home, I’ll post the full text. It’s about how I talk to patients about uncertainty. (“Carefully”), and it’s adapted from my MFA thesis about the Puritan cultural roots of American medicine. The event, called Dual Diagnosis, is organized by the Northwest Narrative Medicine Collaborative, with Profile Theatre. When: 6:45 pm, Friday, Feb. 15, 2019; I am the last of 5 writers reading short pieces. Dual Diagnosis Performance — This Weekend! Northwest Narrative Medicine Collaborative is partnering with Profile Theatre to provide a platform for local doctors, patients, and caregivers to tell their stories together. Dual Diagnosis features writers from our Community of Practice workshops, telling their stories of hope, fear, confusion and triumph, in dialogue with Profile Theatre’s mainstage performance (Un)Conditional, a play written and performed by people living with chronic illness. Profile’s In Dialogue series features pre-show performances that delve into the topics of the stage production. We’re excited to bring our artists to share their stories in tandem with a new community of patient, caregivers and artists. Merilee Karr, How to Remove a Mask? Carefully. Women doctors ARE better — at saving lives, and at motivating patients to save themselves. But in medicine, no good deed goes unpunished. 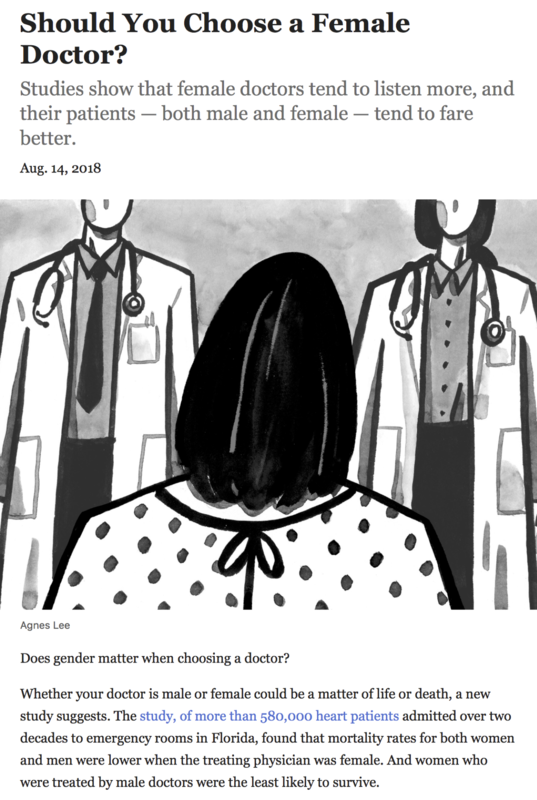 Women physicians pay a price. Better work takes more time. Doctors are paid per patient visit, per widget produced, no matter the quality of the care. There’s no ka-ching! in a life saved, or a life empowered. The (mostly male) powers that be look at women physicians, and see slowpokes who waste their workday chatting with patients, while the speedier men seem to be doing the work. Building relationships? With patients? And their families? What for? Unprofessional! So women docs become less-respected, second-class, part-timers. Like me. I know men who are great doctors and great people. But, as with household chores, they get more credit for having any interpersonal skills at all than women do for black-belt level interpersonal diagnostic skills. We read an excerpt of the opening scene of the play to introduce the characters, and then read a scene. I play NINA, Sheree Wichard plays MAMA and NELLIE MCKEAN, Ashley Turner reads the role of DR. CARISON, and Ingeborg Riedmaier reads STAGE DIRECTIONS. When Ashley Turner contacted me this spring about featuring my essay “Plant Life” on Restoration Row, I thought my writing career was about over. “Plant Life” was published ten long years ago. Since then, I’ve written science journalism: about healthy buildings, and why Portland rats are special. But it’s hard to open doors to editors, as a freelance writer. Let alone finding homes for my creative writing, essays like “Plant Life” and the plays – I was ready to give up. Creative people live in caves, isolated with our creations. When a fellow explorer like Restoration Row pokes their head in and says, ‘Hey! Hello there! Great work!’ – well, it brought my writing self back to life. So thank you, fellow healers. And thanks for sharing with me actor Sheree Wichard, who has proven to be a hard-working, inspiring muse. Since the so-called election last November, I have spent a lot of time brainstorming with and learning from like minds on Twitter. It’s an intense place. I chose to follow smart people, all of them as desperate as I am to save our country and the world. Clicking into Twitter feels like entering a cave I have painted with small bright screens, covering the walls and ceiling, each one dripping the concentrated thoughts of a mind that interests me. It’s an ironically private experience of public matters. I apologize to my reader(s) for being absent so long. I thought I knew why I gave up this blog last fall – because I felt demeaned by the way a certain magazine changed a story of mine without asking. But as I got over it, and sat down to restart this blog last weekend, a deep, paralyzing sadness came over me. What the hell? I thought. So I dove into the emotional laboratory of my journal to place this feeling. And hey, it’s my old frenemy, helplessness, powerlessness, to help or save or protect something. I can’t protect my stories from careless or uncaring editors. Well, so what? As a writer I should have thick skin. Why is this feeling paralyzing? Oh, wait, right. I couldn’t protect Mama from herself. (I went into medicine to learn how to fool people like her into saving themselves. But I couldn’t save her.) I couldn’t keep her from crushing Daddy. Helplessness and I go way back. Should I stop taking risks I can’t control the outcome of? No way. Maybe I should send my stories out and trust them to take care of themselves. But they’re not just stories. I have a debt to the people who trusted me to tell their truth with actual facts. If the copy is wrong, I’ve betrayed them, by not being able to control the editorial process. I can’t resolve this dilemma. But recognizing it helps. Here I am.